Enerjet, which has now replaced the previous version Airgent, is used as a dermal filler without the requirement for injection. It is a suitable treatment option for many conditions; this includes scars, stretchmarks, acne scarring, and more. How Can a Dermal Filler Get into the Dermis When There Is a Strong Epidermal/Dermal Layer? 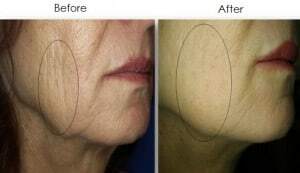 Up until now, the only way to get a thick dermal filler down into the dermis was with an injection, which allows the product to bypass the outer epidermis. The Airgent/Enerjet is an innovative method of blowing in the filler through a powerful wind into the underlying dermis. Once under the dermis, the product can remain in place in much the same way as a regular dermal filler. What Are the Advantages of Using the Enerjet/Airgent? The main advantage is for patients who do not want to have an injection. 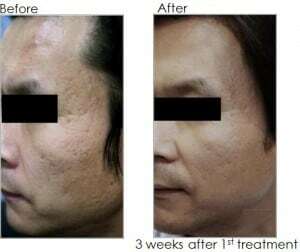 Also, because it places a microform of the filler under the skin, it is ideal for treating large areas, more specifically over the face for full face rejuvenation and skin thickening. What Areas Can Be Treated with the Airgent/Enerjet? Fortunately, this procedure can be used in multiple areas and is commonly used to treat ageing on the back of the hands and neck. We also use it to treat cellulite and stretch marks. How Many Times Does the Treatment Need to Be Repeated? As a rule, patients have one treatment every month; this for a total of three treatments. The area is then reviewed after 12-18 months. Sometimes, the treatment can be a little painful and there may be normal bruising and swelling. Of course, complications and side-effects vary from patient to patient. If you have any concerns regarding side-effects caused by the Enerjet, please consult with the Dr Lanzer medical team. An increasingly large amount of patients now opt for Airgent/Enerjet procedures. Sometimes scars can also be treated with this treatment, particularly acne scars. If you’re looking for an airgent/enerjet procedure, get a free consultation at Melbourne Airgent/Enerjet clinic with Dr Lanzer. Yes, this treatment works well with anything that fills the epidermis; this with the goal of elevating and stretching the skin. The procedure is also used after some cosmetic surgery procedures. Patients who have mini facelifts or blepharoplasty may benefit from skin textural treatments, so Airgent/Enerjet is a valuable tool for these patients. Does This Device Have an Age Limit? There is no age limit, and patients of all age groups can benefit from the treatment. 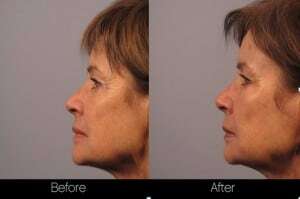 The procedure is also suitable for both male and female patients. Can I See Some Before and After Photographs of the Airgent/Enerjet Treatment? At the Dr Lanzer Clinic, customers can find countless before and after photographs, which have been obtained by patients who had the Airgent/Enerjet treatment at the Dr Lanzer Clinic. Patients can view these photographs as an example of the treatment and the results that could be obtained from it. Do I Have to Sign Anything Before Having the Airgent/Enerjet Treatment? Dr Lanzer can email all patients a detailed consent form, which provides information related to the surgery. This information is made available to all patients before surgery, allowing enough time for the patient to ask any questions they may have. How Can I Make an Appointment for an Airgent/Enerjet Treatment at the Dr Lanzer Clinic? Patients can contact the Dr Lanzer Clinic via telephone, email, or the website contact form to make their appointment. Get in touch with us today and we will schedule an appointment to match your busy schedule.